Dublin’s All City has been doing a fine job of late in recovering and reissuing widely forgotten treasures from the Irish undergrowth, reinstating their significance to the country’s musical canon in the process. Last year, the label released Quare Groove Vol. 1, an eight-track collection of rare groove, post-punk, funk and disco from the 70s and 80s. The release celebrated a vital, versatile and brilliantly weird underbelly; one that shirked the outward facing ambitions of more “marketable” acts while leaning further into the studio experimentation and oddity that would go on to become the touchstone of Ireland’s musical landscape for decades to come. One of the compilation’s standout moments was Stano’s ‘White Fields (In Isis)’. Dropped between the galactic videogame pop of Those Nervous Animals’ ‘Hyperspace!’ and Barry Warner’s yelping,My Life In The Bush Of Ghosts -like ‘Losing Control’, Stano’s no wave cut swerved and bounced with a boyish arrogance, his open-gobbed vocals seeming eager to swallow the bass and drum patterns that trounced around them. The track wielded the sort of brash confidence and exuberance that only someone with no restrictive formal training could produce and was, as it happened, just one of 12 outlandish, wry and lovingly off-kilter cuts that the self-professed “non-musician” included in his 1983 debut LP, Content To Write In I Dine Weathercraft. Now, continuing their archival venture, the folks at All City have reissued that seminal album of Irish experimentalism. In doing so, they have shone a light on an artist whose significance runs deep and who, in many ways, prefaced the gnarled, accented and inflected authenticity that has since resurfaced in Irish artists like Kojaque, Girl Band, Fontaines D.C, Handsome Eric and Robocobra Quartet. Stano’s approach to music at the time of recording was like that of a child playing Blind Man’s Bluff on Dublin streets to find musicians like sitarist Michael O’Shea or fumbling within the local scene to tag multi-instrumentalist Vinnie Murphy, audio engineer Terry Cromer, Jerome Rimson, Chant! Chant! Chant! Guitarist Robbie Wogan, pianist Dave Murphy and Daniel Figgis on keys. The method, he has explained, was to ask these musicians, from varying stylistic backgrounds, to simply play while being recorded; together or alone, with delay units or without. He would then pick from those recordings the bits he liked and proceed to chop and edit them into form. Same went for the drum programming, which he “learned” by sheer intuition, creating patterns that were unorthodox and built on instinct rather than conventional groove. This crude and joyously chaotic process ends up feeling like something in between early hip-hop production and abstract collage. But through it, Stano made an album that touched on something both beautiful and raucous, its lo-fi grit being accentuated and elevated by his distinctly North Dublin spoken drawl. Everything about it lovingly shouts “Dublin” – from its mumbled poeticism and unabashed dog-eared musicality to its grey, cold, magnificent atmosphere. ‘A Dead Rose’ introduces the album with clicking rhythm and absorbing layers of sitar and guitar, which breathe life into Stano’s brittle poetry. The gradual, barely-there pitch alterations to his voice give the feeling of a meandering stream of consciousness, directed at some imagined figure before him or within. From there, ‘Blue Glide’ and ‘Emma Wild’ cast a droopy eye to Stano’s equally disobedient contemporary across the pond: one Mark E. Smith, who, in the same year as Content’s original release on Scoff Records, released The Fall’s Perverted By Language. Distorted, turgid guitars fall on disjointed rhythms while Stano’s abstract vocals flail on top with an unlikely charm. It’s in these moments that it becomes hard to not to draw comparisons between this once-deemed forgotten voice and that of Girl Band’s Dara Kiely, whose sardonic and desperate vocals on 2015’s Holding Hands With Jamie propelled the similarly off-kilter noise rock band to lofty heights in before they were forced to cancel all forthcoming shows in 2017 due to health concerns for the singer. ‘Melting Grey’, ‘Out Of The Dark, Into The Dawn’ and ‘Seance Of A Kondalike’, by contrast, show a more reserved version of the producer, whose studio manipulations find guest vocalists, emotive piano layers, haunting keys and lethargic drum patterns crafting a uniquely absorbing mid-section to an album the likes of which were scarce in the era. 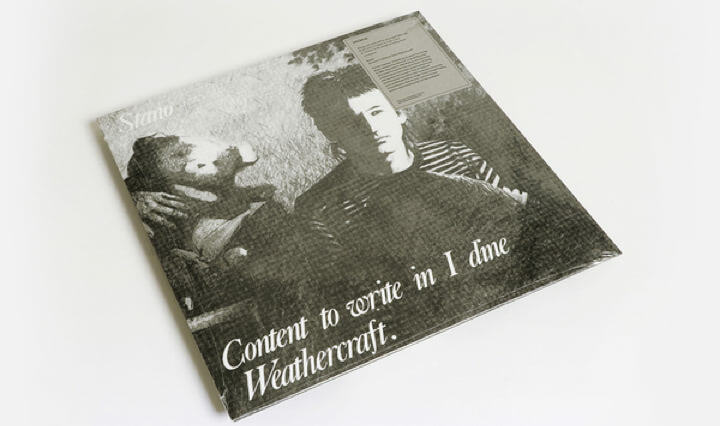 Content To Write In I Dine Weathercraft ends with ‘Young Colatic Child’, a heartrending ballad that feels as staggering now as it should have been in 1983. It is heartening to know that Stano is, to this day, a core fixture Ireland’s arts community and has, since this debut, released 12 albums on numerous labels. One can only hope that, with the help of All City’s continued work, Stano and the other forgotten progenitors of Ireland’s rich, diverse and distinct music scene will soon be ranked among the country’s most influential.